Laryngotracheal stenosis develops when scar tissue forms in the trachea and, rarely, in the larynx itself. Symptoms depend on the degree of airway obstruction and can range from asymptomatic to upper airway obstruction severe enough to cause death. We report on 21 patients who underwent tracheal resection for severe stenosis. Resection remains a good option in this situation, and there is a minimal need for specialised postoperative care or intensive care unit admission in the majority of cases. Management of LTS depends on the degree of obstruction. Patients with milder obstruction may benefit from conservative measures alone, while more severe cases can require a combination of options. Endoscopic surgical procedures include use of a carbon dioxide laser, balloon dilatation and/or debridement. Open options usually entail resection of the trachea and end-to-end or slide anastomosis. Open procedures may be augmented by cartilage grafts or stents. Tracheal release techniques may also be required in some cases. [6-11] In the perioperative period, all patients should receive optimal medical therapy in the form of antireflux therapy, corticosteroids and antibiotics. Mitomycin C is sometimes used intraoperatively to prevent fibrosis. We report on a cohort of 21 patients who underwent tracheal resections for LTS over a period of 10 years. A retrospective chart review was done to identify patients with LTS presenting to the Department of Otorhinolaryngology at Universitas Hospital, Bloemfontein, South Africa, between 2001 and 2011 and requiring tracheal resection. The relevant data were collected from the patient files. The protocol was approved by the ethics committee of the University of the Free State, and written informed consent was obtained from the patients. Consent was also obtained from the chief executive officer of the hospital and the heads of the departments of Critical Care and Cardiothoracic Surgery. The ages of the patients ranged from 8 to 42 years (mean 25); 15 were males and 6 females. In our facility we tend to see patients with severe stridor as emergency referrals, so a high proportion of patients (18/21) required tracheostomy before definitive surgery. This unfortunate situation is a result of the referral system, in which patients are often misdiagnosed as having asthma or other respiratory tract pathology and treated incorrectly. Also patients themselves often do not report minor symptoms, so tend to present late with severe respiratory distress. This contributes to the length of resection required, as will be expanded on below. Nine of the 21 patients had comorbid pathology. Although HIV testing was not done routinely, one was known to be HIV-positive, with a CD4+ count of 299/μ! and not yet on ARV treatment. Three had brain injuries, two had attempted to commit suicide, two had diabetes mellitus (DM), and one had DM and ischaemic heart disease. In general, patient compliance in our setting is often poor and adequate follow-up is problematic. This is probably a multifactorial problem and reflects the low socioeconomic circumstances of most of the patients. Our average follow-up was 13 months (range 4 - 48). Patients underwent endoscopy and examination under anaesthesia. A computed tomography scan was also done before planning the surgery. Findings were documented using a standard data sheet. All the patients in the group had severe airway stenosis (>90%) not amenable to treatment options other than resection. Our facility has been using a carbon dioxide laser for the management of LTS since the 1980s, but it was not an effective management option in this patient cohort owing to the severity of the stenosis (>90%, length >1 cm) and/or its position lower down the trachea. We used the laser in five patients in an effort to avoid a more invasive procedure (with a maximum of three attempts), but this proved to be unsuccessful. Interestingly, only one of the patients in whom laser rescue was attempted was without a tracheostomy. The advantage of a tracheostomy during laser procedures is that the airway is not compromised. A T-tube was inserted in one patient after three failed laser attempts. Unfortunately the patient still experienced stridor and respiratory distress, and it was decided to perform a resection. A segmental airway resection with primary anastomosis was performed. The technique is fairly standardised and done under general anaesthesia. The patient is positioned in the supine position with mild extension of the neck. If a tracheostomy tube is in place, it is changed to a reinforced endotracheal (ET) tube through the tracheostomy stoma and fixed on the chest. An apron incision is made and a subplatysmal skin flap raised. Midline cleavage of the thyroid with lateral displacement and exposure of the trachea may be challenging owing to the fibrosis caused by the tracheostomy. Care should be taken to ensure that the dissection level is on the level of the tracheal cartilage, or mobilisation of the trachea will be insufficient. The trachea is mobilised in this plane as far as possible into the mediastinum. During the procedure it is necessary to keep the normal course of the recurrent laryngeal nerves in mind, to avoid injury to them. Segmental resection was performed with either a trachea-to-trachea (end-to-end, EE), cricoid-to-trachea (CT), or trachea-to-thyroid cartilage slide (TT) anastomosis. Resection is done using a stepwise incision (Castle incision) into the stenotic segment until healthy airway is encountered superiorly and inferiorly. The segment is resected, taking care not to injure the oesophagus posteriorly. Placement of a small oesophageal dilator can be helpful. It is important to conserve the superior and inferior stumps of the planned anastomosis. If possible, handling of the mucosal surfaces should be avoided and even cuts should be made when resecting. A decision regarding suprahyoid release is made after the resected section has been measured and the degree of tension determined by the surgeon by pulling the inferior and superior stumps together. In the group studied, all patients with a stenotic segment >4 cm in length had a suprahyoid release. It was not necessary in any patient with a resected length of <3 cm. For stenoses of 3 - 4 cm in length the surgeon needs to make a clinical judgement, as some patients with a 3.5 cm resection needed a suprahyoid release and others with 4 cm resections had no release. In total, a suprahyoid release was done in 12 of the patients, with one patient undergoing a supra- and infra-hyoid release. This patient only had a 3.5 cm resection, but severe fibrosis in the normal neck planes due to attempted suicide prevented adequate mobilisation. Three Vicryl 0 sutures are placed in the posterior wall, starting at the 6 o'clock position with one each on either side at the 7h30 and 4h30 positions. It is imperative that all the sutures are tied on the outer surface of the trachea. This is followed by placing sutures at the 9 o'clock and 3 o'clock positions. After this, the ET tube through the tracheostomy stoma is replaced with a trans-oral ET tube, guided past the anastomotic site under direct vision. The last three sutures are placed at the 10h30, 12 o'clock and 1h30 positions, and tied. In total, eight Vicryl 0 sutures are placed. Additionally, some Vicryl 5/0 may be used to create an airtight seal. A 6 mm Porto-Vac is inserted and the neck is closed by approximating the strap muscles and subcutaneous tissue, and then closing the skin. All patients are extubated postoperatively in the operating theatre and taken to a high-care ward. Standard postoperative care includes intravenous corticosteroids, antibiotics (Augmentin) and antireflux therapy for 7 days. One patient in this series was subjected to neck flexion postoperatively, and none to fixation. Other treatment follows standard medical care regimens, e.g. treatment of DM. Patients are discharged after 7 - 10 days with scheduled follow-up visits. 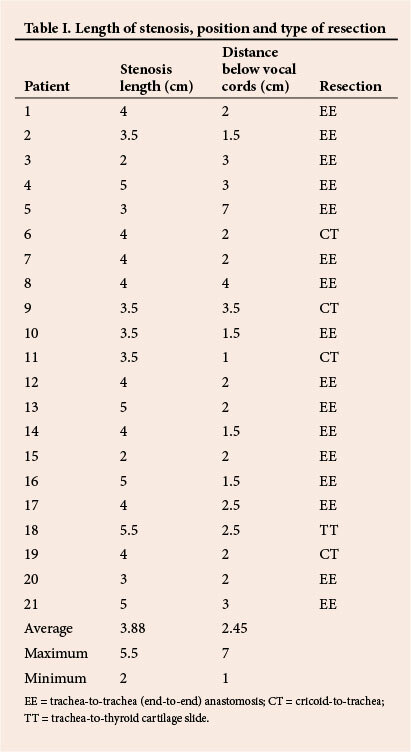 Table I shows that in most cases we had to deal with a fairly long stenosis, the average being 3.88 cm. As mentioned earlier, this is probably a result of the high incidence of preoperative tracheostomies, and the fact that not all of them were placed through the stenotic segment of the trachea. Almost 40% of the tracheal length, or approximately 4 cm, can be resected without the need for postoperative neck flexion or head fixation. If a tracheostomy is required preoperatively it is important to insert it in the stenotic segment if possible, to spare healthy trachea. Two of our patients had relatively small stenoses (2 cm in length). One of them had an attempted laser procedure before surgery, and the other was an 8-year-old child. As mentioned earlier, our cohort generally included patients with more severe stenosis, and success with use of the laser diminishes as the length of stenosis increases beyond 1 cm. Another point to note is the distance between the stenosis and the vocal cords. In one patient the stenosis was 7 cm below the vocal cords, but the rest were situated just below the vocal cords, with the average being 2.45 cm (2.23 cm if the patient referred to above is excluded). This obviously influenced the type of resection performed: EE (16/21), CT (4/21), or TT (1/21). The average distance of the stenosis of 2.45 cm below the vocal cords in our patients is of the utmost importance. It is unlikely that a tracheostomy tube cuff would cause damage so close to the vocal cords. A tracheostomy incision is done at least 2 - 3 cm below the vocal cords and the cuff is another 2 - 3 cm below that, totalling at least 4 - 6 cm. It can therefore be assumed that in all but one of our patients (patient 5), the damage and subsequent tracheal stenosis was caused by the ET tube cuff. Unfortunately we were unable to determine how many patients actually received a tracheostomy for prolonged intubation while in the intensive care unit (ICU). Numerous factors are involved in the development of tracheal stenosis, but it does seem that in most of our patients conversion to a tracheostomy tube was not done, or was not done early enough. Patient 11 had a T-tube placed with the resection, and it was removed successfully after 9 months. Patient 18 had a tracheostomy tube placed during the surgery which was removed after 1 month. This patient also required numerous procedures after resection due to repeated restenosis, including three laser laryngoscopies and two balloon dilatations. Patient 19 had 11 laser laryngoscopies and two balloon dilatations after resection. These two were the only patients to undergo balloon dilatations, and to have a postoperative course so fraught with complications. The precise reasons are still unclear. In total, 6/21 patients (7, 12, 13, 16, 18 and 19) had laser laryngoscopy after surgery for minor problems such as granulomas and small webs. We applied mitomycin C in two patients (2 and 4) because of its ability to reduce scar formation, but it did not become part of our standard regimen. Two patients had postoperative bleeding, and one had to be taken back to theatre for definitive management. A further two had local wound complications, mainly infection and granuloma formation. It is of interest to note that these were patients 18 and 19, who were to have repeated restenosis of the trachea. One patient had postoperative dysphagia, which subsided within a few weeks. These results suggest a low complication rate for suprahyoid release. One patient had facial oedema after surgery which cleared up within a few days. Two patients developed pneumonia postoperatively and responded well to intravenous antibiotics. Two patients had a right-sided vocal cord injury, but these were present before surgery. Most patients (18/21) had a tracheostomy done before surgery, which complicated the procedure by adding to the length of the segment that needed to be resected. Despite the fairly long length of the resections, all the patients were extubated and only one required neck flexion without fixation. A suprahyoid release is rarely indicated if the stenosis is 3 cm or less in length. However, if the stenotic segment is more than 4 cm long, a suprahyoid release should be done to relieve tension on the anastomosis and avoid the necessity for postoperative neck fixation. In our experience this procedure has a low complication rate, with only one patient experiencing temporary dysphagia. Other long-term complications are rare. Our results further support the practice of performing a tracheostomy within 7 - 10 days in ICU patients requiring prolonged ventilation. The severe complications experienced by patients 18 and 19 may imply poor wound healing in these individual cases. Tracheal resection for LTS remains a good option for severe stenosis. The need for specialised postoperative care is minimal and ICU admission is not necessary in the majority of cases. All our patients were decannulated, which plays a significant role psychologically. In general, long-term complications are rare.